Create a refuge in just this one space that attracts and invites — and do it through outdoor lighting. Curb appeal is queen — it is what onlookers see as they walk or drive past and it is the space guests first see before they enter, so give them something uncommon and bewitching. An alluring curb appeal is correlated to a higher asking price when looking to sell because the perceived value is greater. So, don’t overlook your front porch — with some easy additions you can spruce up your outdoor space in no time, and outdoor lighting can serve as aesthetic pieces that also illuminate this area. There are so many aspects when it comes to your home design and Brighter Homes Lighting in Eugene wants to make your decisions simple. 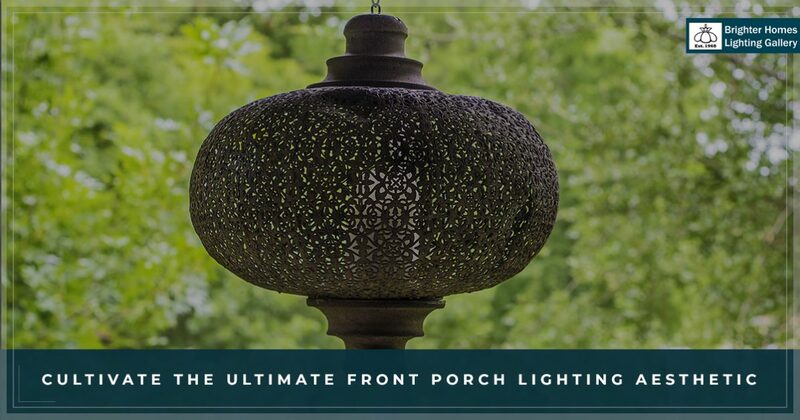 Partner with us for all of your outdoor lighting needs and take away a few great ideas for your front porch lighting in today’s post. There are many ways to upgrade your front porch space and lighting design is one aspect that creates lasting style. For a front and center flush mount for your porch area, choose timeless mounts from Garfield Park or Capital. These mounts come in distinct finishes and colors that contrast well with dark or light colored home exterior colors. These outdoor lighting options are damp- and wet-rated which make them a perfect option for a covered porch space. Further illuminate your space with outdoor sconces on each side of the door for a clean, yet classic look. Pro tip: When you are shopping our online gallery for outdoor lighting, look for our lighting specifications (wet- and damp-rated) to ensure each fixture will work in your outdoor space. If you revel in the farmhouse or shabby-chic aesthetics, bring this style to your front porch space. A black matte lighting fixture is the perfect place to begin. 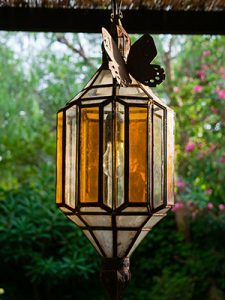 Lantern lighting such as these from Kenroy Home and Feiss fit well in a cozy front porch area. Add a classic metal mailbox on one side and a wall sconce above it — try this one from Designers Fountain. Implement additional design elements such as a rocking chair, an outdoor welcome mat, and potted plants tie the look together. Pro tip: Damp-rated lighting is ideal for outdoor lighting under a covered porch — it is able to withstand any major temperature swings, but keep in mind they still need to be covered and protected. Many flush and semi-flush lights in our showroom are wet and damp rated, which provide durability and longevity in your outdoor lighting design. Cultivate a modern vintage look with large address numbers above the door or to the side and an abundance of sleek lines with fixtured from nickel or stainless steel. Get the look with these out sconces from Z-Light and PLC Lighting. Oversized planters and bold, bright colors make for a modern vintage front porch. Enhance your front porch space with endurably designed outdoor lighting and refresh your curb appeal and set an inviting ambiance! Partner with us today and peruse our Eugene lighting showroom!